The US Congress passed the Geospatial Data Act (GDA) of 2018 as part of the Federal Aviation Administration (FAA) Reauthorization Act (H.R. 302). The bill’s sponsors were Sen. Orrin Hatch, a Republican from Utah; Sen. Mark Warner, a Democrat from Virginia; Rep. Bruce Westerman, a Republican from Arkansas; and Rep. Seth Moulton, a Democrat from Massachusetts. Agreeing to this common vision will make it easier for federal, state, and local agencies of all sizes to integrate location data into widespread practice. The passage of this bill presents new and exciting opportunities for the public and private sectors, universities, organizational stakeholders, and the public to strengthen the geoplatform and ensure that geospatial data is made more widely available to support government programs. As federal agencies implement the GDA in the coming months and years, it is critical that leaders build upon and augment the incredible work the government is doing with geospatial data and tools. Federal missions will be best served by agencies working collaboratively to utilize geospatial data for analysis, problem solving, and enhancing situational awareness. Esri stands ready to support congressional leaders, agency heads, the Federal Geographic Data Committee, and the entire ecosystem of geospatial data users and providers as the GDA is put into practice. The power of geospatial data is transformative. This act has paved the way for improved data standards and accessibility, which will fuel innovation throughout the nation. Prefectura Naval Argentina, the Argentine Coast Guard, and Aeroterra S.A., Esri’s distributor in Argentina and Uruguay, have partnered to implement a real-time tracking system using the ArcGIS platform. The new system, called Guardacostas Pro, uses satellite imaging and signal processing to monitor vessels for illegal activities such as drug smuggling and fish poaching in the coastal waters of Argentina’s exclusive economic zone (EEZ). Prefectura Naval deploys patrol vessels, helicopters, and airplane spotters to protect its economic interests and preserve its fishery. This year, Guardacostas Pro assisted Prefectura Naval in catching a ship that had poached approximately $380,000 worth of fish from Argentinian waters. The ship was impounded and fines levied based on the data collected. Until recently, Prefectura Naval’s primary enforcement tool was constant patrolling and investigating ships. Now Guardacostas Pro monitors the collision avoidance signals that every vessel transmits. These signals provide data on vessel type, speed, and location. When combined with satellite imaging and the spatial analytics capabilities in ArcGIS, this system sends coast guard personnel real-time alerts when vessels enter EEZ waters. Once the system was proved at sea, it was moved ashore and has become a multiagency tool that aids the Ministry of Security’s homeland security mission. These layers are useful for monitoring changes to the landscape that result from expanding urban areas or events such as volcanic eruptions, earthquakes, or mudslides. The best place to explore previous world imagery versions is through the World Imagery Wayback app, which can be accessed from ArcGIS Living Atlas of the World. The app presents the versions within a map along with a timeline and list of available versions. Preview changes between versions by hovering over or selecting individual layers. 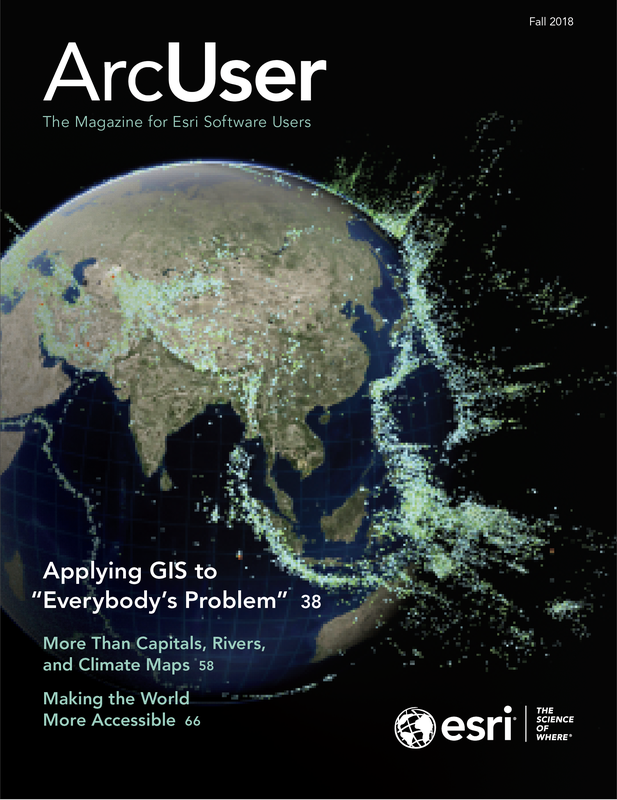 The desired Wayback layers located in the app can be added to an export queue and pushed to a new ArcGIS Online web map and incorporated in Esri Story Maps apps, such as Swipe and Spyglass. In addition to adding individual imagery layers to an ArcGIS Pro map, you can browse, search, and load Wayback imagery items through the Catalog in ArcGIS Pro with a direct connection to the Web Map Tile Service (WMTS). WMTS is a standard protocol for serving prerendered or runtime computed georeferenced map tiles over the Internet. The World Imagery Wayback app allows you to access more than 80 different versions of world imagery that were captured over the past five years. 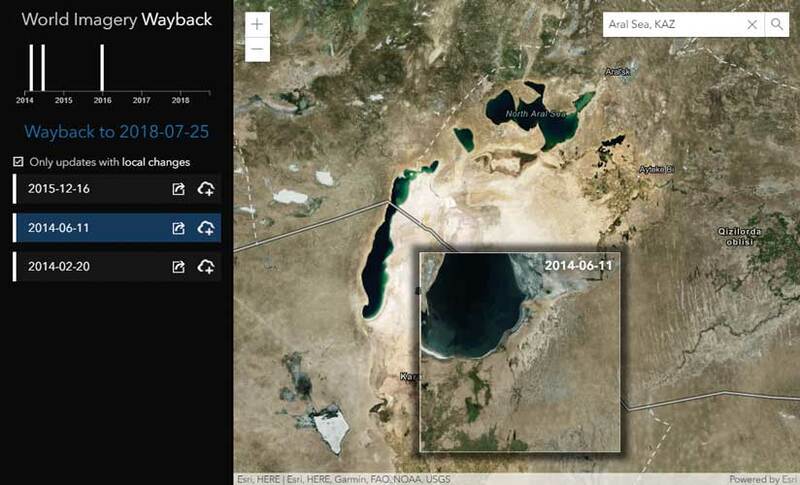 Wayback imagery is a digital archive of the World Imagery basemap available from Esri that allows you to access more than 80 different versions of world imagery that were captured over the past five years. 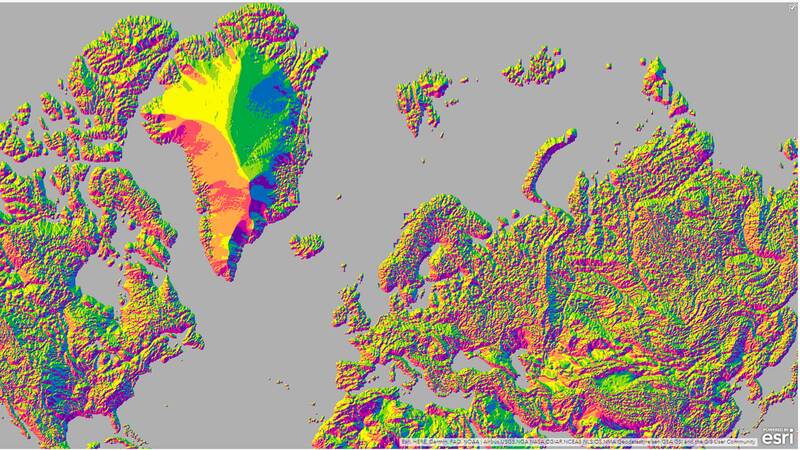 This imagery can be viewed in the World Imagery Wayback app and added to ArcGIS Online, ArcGIS Pro, or ArcMap. Read this blog to learn more about using Wayback imagery.